When the Eurosceptic Conservatives and the pro-European Liberal Democrats entered into coalition, their constructive approach to Europe took commentators by surprise. An analysis of the leaders’ speeches demonstrates that they were instrumentally identified on the belief that membership of a reformed EU was in Britain’s national interest. In 2013, Cameron adopted a harder Eurosceptic position and emphasized the differences between Britain and Europe. He thus limited the possibility of ideological identification, leaving appeals to the national interest as his only rhetorical option. 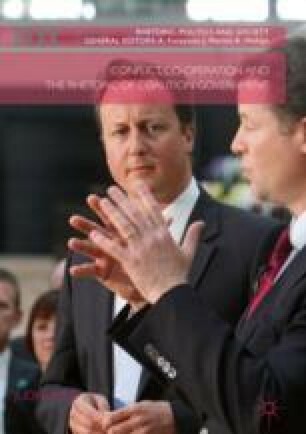 The chapter then examines two parliamentary debates, revealing that Eurosceptic Conservatives used the concept of parliamentary sovereignty to differentiate themselves ideologically from the Coalition’s position. This strategy proved highly effective in rallying backbench support for the EU (Referendum) Bill.